Megan Pierce has lived the life of an upper middle class suburban loving wife and mom for 17 years, but she has a huge secret. Her life is a lie. She thought she left her old wild life completely behind when she ran from the scene of a crime in Atlantic City and her lover Ray. Now the crime and her whole secret past has come back to haunt her and to wreak havoc on her life. The tension is palpable – a real who-done-it page-turner with cliff-hanger chapter endings, really creepy characters, and characters the reader sympathizes with. I would even say there’s an element of terror here – I might say that – it’s almost horror but not quite, not by my standards, anyway. Scott Brick can make a phone book suspenseful and what with the style of Coban it’s a perfect fit. 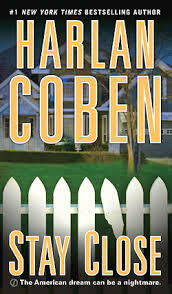 I’ve never read a book by Harlan Coban before but next time I need a breather from the literary selections or nonfiction I usually read I may head over to him. ** Books in the crime and mystery genre are rated on a A to F basis as they have completely different standards of excellence from general fiction. Crime novels depend almost entirely on plot an character development for tension. Structure and style are important only as they contribute to the suspense. When style interferes with the plot development it turns quickly into a negative.